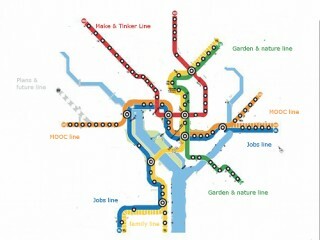 Look for a map ( Washington Metro) Copy with Snagit or printscreen and save. Edit the map with Gimp or some other image editor: copy a part, delete it an past a new part in the same place, with name of metro station or part of line. You could write down names of stations that would show on your map. 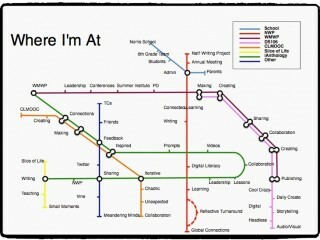 Chad Sansing took Sara Green’s idea for revamping the famed London Tube Map for a map of learning, and created a remixable Webmaker Thimble webpage. Thanks to Chad, anyone can now make their own Tube Map, which is a handy way to think about learning communities and networks and nodes, and the way ideas can connect with each other, through a very visual lens.